Does coffee really stain your teeth? If it does, a planned retail development in Duluth will help you not only cause the stain, but also clean it. Planned at the corner of West Central Entrance and Myrtle Avenue, a new retail building is planned that would include a new Aspen Dental office along with a Starbucks and an undisclosed retail/restaurant space. Launch Properties is planning a the commercial building that would total 8,460 square feet and would include three different retail spaces. The site currently is home to a few residential properties which would be demolished to allow for the new construction. The site is directly across from the new MedExpress clinic that opened last month on a site that had sat vacant for years since the Residence Inn opened their doors next door. Aspen Dental would fill 3,500 square feet of retail space within the corner at the new retail building, their space facing the intersection of West Central Entrance and Myrtle Avenue. Aspen Dental has over 500 locations spread across the United States in 36 different states. Currently there are 8 Minnesota locations with almost all being within the Twin Cities area. This would be Aspen Dental's first northern Minnesota with the next closest being in Cambridge, MN. Based out of Dewitt, New York, Aspen Dental provides dental services that include everything from your routine check up to your root canal. Their offices provide short term and long term dental care and prides them selves on no hidden fees or inflated pricing. Aspen Dental technically is a "dental support organization." What that means is they offer their name, branding, and services to individual licensed dental practitioners who operate under their name. Aspen Dental might know exactly what their doing. They'll be setting up shop one retail space away from none other than Starbucks. Starbucks is planning on occupying a 2,242 square foot space on the far right side of the building. The company would relocate their location that current sits across from the Miller Hill Mall at 1405 Miller Trunk Highway, something that the company had been hoping to do for many years now. Duluthians can celebrate as this location with be complete with a drive thru. No more of your coffee getting cold in those 15 seconds of you walking from the store to your car. Speaking of cars, there's one more reason to celebrate. 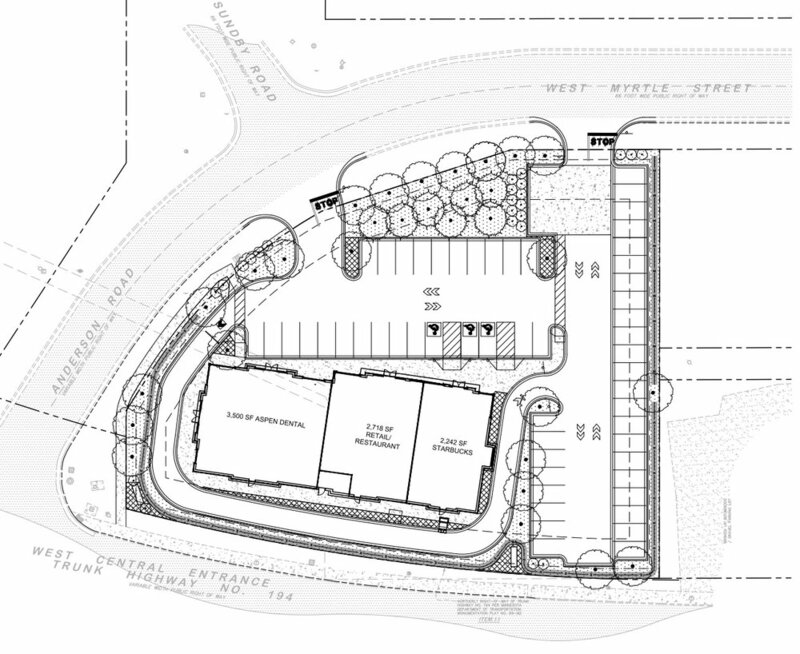 There will be a FULL parking lot at this new Starbuck's location, 55 spaces to be exact. No more parking on the street due to the eight spots being filled at the current Starbuck's location. Whew. The is one remaining space within the commercial building that encompasses 2,718 square feet and is pegged for a retailer or restaurant. This would be a perfect space for a fast casual restaurant for something along the lines of Qdoba or Panda Express. We'll send an email. This project is set to go before the Duluth Planning Commission at the August 8th meeting. If approved, the project could begin construction this fall with an opening in early Summer 2018.